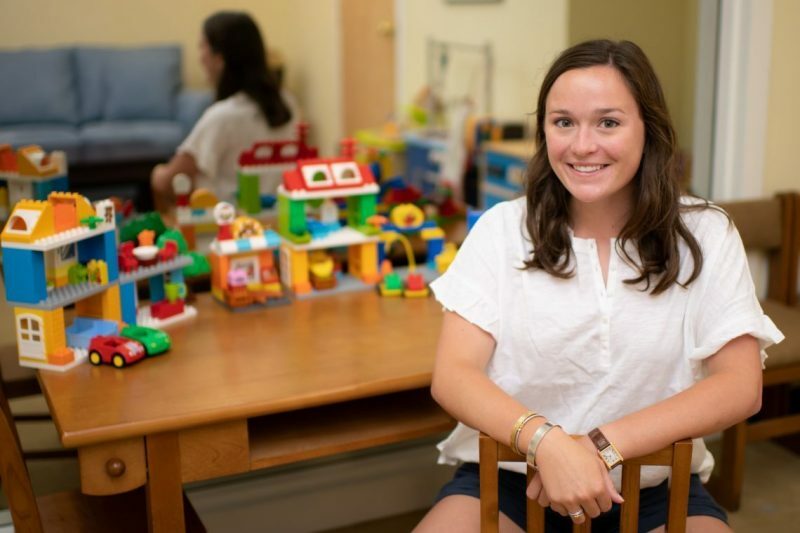 Informed by Child’s Play This summer, Davis Straske '19 is researching children's play in psychology professor Megan Fulcher's Gender Development Lab. Q: You are assisting psychology professor Megan Fulcher this summer with research for her ongoing project titled “Can you build a dad?” Please tell us more about this project. A: The “Can you build a dad?” project investigates the styles of scripts children use when they play with building block toys like LEGOs. These toys foster children’s development of spatial skills, but when paired with more domestic accessories, perhaps their scripts change. Children, ages 3 to 10, are given a LEGO mini-figure of their same gender to play with, as well as an accessory, like a baby and a stroller, a lawnmower, or a hot dog cart. We are interested to see if the pairing of the accessory impacts how children play with that building toy. Q: What made you want to be part of this work? I’ve been interested in developmental psychology since high school; serving as a babysitter, camp counselor and dance instructor for preschool and early school-age children has fostered a love of working with children. Psychology was a field that instantly clicked with me, because I was learning the facts and theories behind the behaviors of children. Researching developmental psychology is the science behind what makes children so great and so interesting. Q: What does an average day for you look like on this project? Typically, my days involve a couple of different tasks. As the participant coordinator of Dr. Fulcher’s lab, I contact and schedule families to come in for a research session. I prepare materials for these meetings, setting up LEGO sets, recording devices and prizes for participants. I spend about an hour a day with families who come in for a research session, which involves greeting families, walking them through paperwork, and ultimately giving the child the broad instructions for the study. A normal day usually involves some data entry and interpretation, as well, using statistics and coding programs like SPSS and ELAN to analyze data. Some days involve community events at places like the Rockbridge Regional Library or the Lexington Office on Youth, to teach psychology lessons and meet families that may be interested in our work. Q: What is the most interesting knowledge you’ve picked up while doing this work? Through working with Dr. Fulcher, I have been able to fine tune my personal academic and research interests. The lab’s studies on toy play have truly been the kick start to my own honors thesis project, which looks at how toys may impact the development of preschool children’s empathy. Not only have I found a research interest of my own, but my work experiences in the lab have prepared me to develop, recruit for and run this student-run research project. Q: How has this experience changed your working relationship with Professor Fulcher, and how does that relate to your wider experiences at W&L in terms of student-faculty relationships? I am fortunate enough to have worked in Dr. Fulcher’s Gender Development Lab since the winter of my freshman year. Since that time, my responsibility within the lab has increased, moving from a research assistant, to a community liaison, to now the participant coordinator for the lab. This student-faculty relationship has been a key part of my W&L experience, and I really am grateful to attend a university where these relationships are fostered and encouraged. Since the beginning of my freshman year I have been encouraged and challenged academically by the entire psychology faculty through introductory classes and research methods classes, developing skills that I now use on a daily basis as a summer research assistant. Being matched with Dr. Fulcher as my first-year advisor allowed me to study and get involved with developmental psychology almost immediately, maximizing my time and experiences in the field. I have assisted with eight research projects in the lab, doing anything from data entry and analysis to running the studies myself. This research experience, paired with each semester’s seminar classes, have given me a well-rounded understanding of the academic field of psychology. I have developed an incredible relationship with my advisor, I have made connections with individuals of the Lexington community, and I have been able to work with psychology students of all class years in our research lab. Working in this lab has allowed me to develop relationships with students, faculty and members of the community I may not have met otherwise. I’m grateful for the opportunity to have worked for Dr. Fulcher for so long, but I imagine that any research experience like this is important and beneficial for W&L students. I dance, choreograph with, and serve as the co-president for the W&L Repertory Dance Company. I’m the vice president of recruitment for the Panhellenic Council, and I teach creative movement classes for kindergarten and first graders at Halestone Dance Studio. I’ve been interested in psychology since high school, and each of the introductory psych courses at W&L confirmed that it is what I love to study and what I hope to continue to learn about. Continue my passion for developmental psychology research on socio-emotional development, either in graduate school or through a research center. What is your favorite W&L memory? When my younger sister (class of 2021) decided to come to W&L! Dance 202, Dance Europe (Spring Term 2018): studying the history of modern dance in Britain. The abroad course involved seeing shows, taking master classes in modern and aerial dance, and engaging in the critical response process every day for three weeks in London.